“When Ashley was two years old, she was nonverbal, ate only two or three types of food, and cried a lot out of frustration,” said Dana, Ashley’s mother. Ashley started receiving Applied Behavior Analysis therapy at the Brent Woodall Foundation for Exceptional Children, a charitable nonprofit dedicated to empowering families of children with autism and other developmental disabilities, when she was just two years old and unable to look anyone in the eye, communicate what she wanted, or play with her sibling. Ashley began in the Intensive Intervention Program, through which she received at least 15 hours of one-to-one Applied Behavior Analysis therapy per week. Ashley’s parents and the behavior analysts at the Foundation worked together to create a customized education plan to help Ashley reach her fullest potential. “By the time Ashley graduated, we knew she would be ready for Kindergarten. She now speaks in full sentences, she is a very happy child, and although she is still picky about her food choices, she eats about everything most children her age eat,” said Dana. A year and half after graduating from the Brent Woodall Foundation, Ashley just finished her kindergarten year as an exceptional six-year-old student in an all-inclusive classroom. “She made wonderful grades and her teachers raved about her,” chimed Dana. Ashley also just wrapped up her second season playing basketball for the Coppell YMCA. The skills Ashley developed in the one-to-one therapy and social skills groups at the Brent Woodall Foundation played a key part in helping Ashley learn to share, take turns, and be a team member. One of Ashley’s favorite events of the Brent Woodall Foundation was the annual Walkabout for Autism, a fundraising event that allows the Foundation to offer families like Dana and Ashley’s the therapy and training they need to change their lives for little to no cost. “We have gone to the Walkabout every year that we can,” said Dana. Here children enjoy the games, face painting, and bounce house and Dana enjoys the raffle prizes as well as the friendships she developed with the other parents and staff at the Foundation. 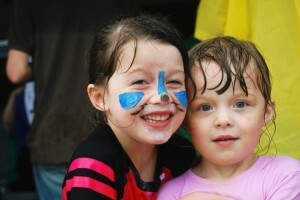 Pictured above: Ashley and her sister at a past Walkabout. 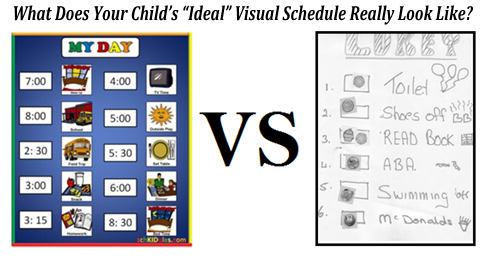 For many parents the words “visual schedule” spark images of printed picture icons, heavy-duty Velcro, costly lamination, and a level of bright creativity only a third grade teacher can expect to pull off successfully. 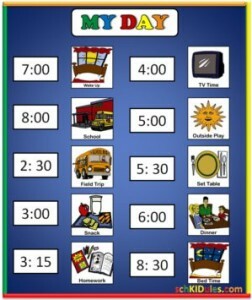 For some children this type of schedule is ideal. It may even be the perfect fit while at school or other activities outside of home. For some therapists this type of schedule may be considered the ideal at-home schedule as well. However, the folks at Woodallkids Outreach have found that this vision often does not match the reality of a home environment. They have also found that this is perfectly fine! 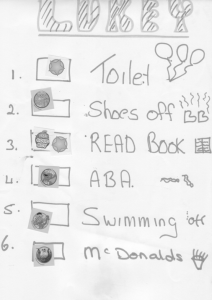 While any at-home visual schedule should be organized, readable, show completion, and prepare children for a written schedule, it is important to note that a schedule on a piece of paper with hand written instructions and a simple reinforcement system, such as check marks or happy faces, can be just as effective for some children as that “ideal” polished schedule of perfection. 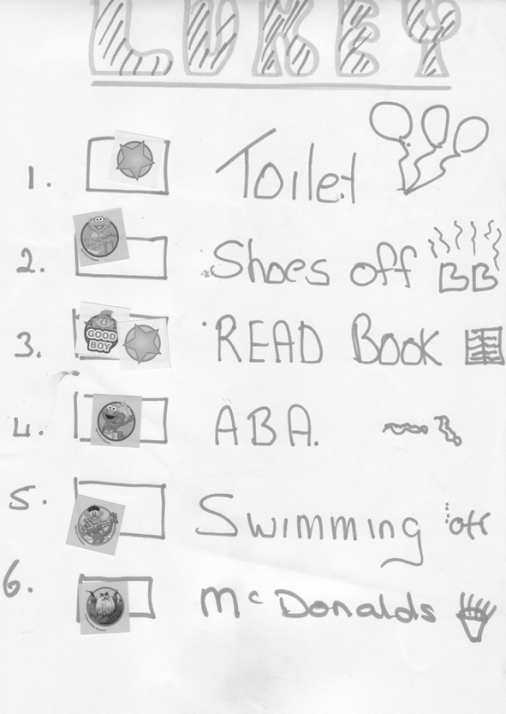 Below is an example of how one Woodallkids Outreach family incorporates this principle into their morning routine with a list of things we just love about this at-home visual schedule. 1. It does not require any expensive materials or programs. 2. Each day Lukey gets to choose the colored markers his sister uses to decorate the schedule and which set of stickers he wants to use as check marks – encouraging ownership throughout the day. 3. His sister’s help not only encourages their daily interaction, but also allows his sister to be an important part of an activity that is inevitably a large focus of the day for the entire family. 4. By involving his sibling, Mom has provided a time every day that promises an opportunity for his sister to receive praise for her contributions (writing skills, reading ability, creativity) and support of her brother. 5. It is easily adjustable so that when plans change, rather than only providing a verbal explanation, Mom can simply draw a line through “swimming” and write down “Shopping with Grandma” instead. While this type of schedule may not be ideal for every child, it is important to realize that any child’s schedule can be modified to fit the needs of both the child and the family regardless of how it is assembled. One of the most important goals of the Woodallkids Outreach Program is to help your family creatively incorporate behavioral principles not only throughout your day, but also with the involvement of your entire family, and incorporating an individualized visual schedule is often a great place to start. 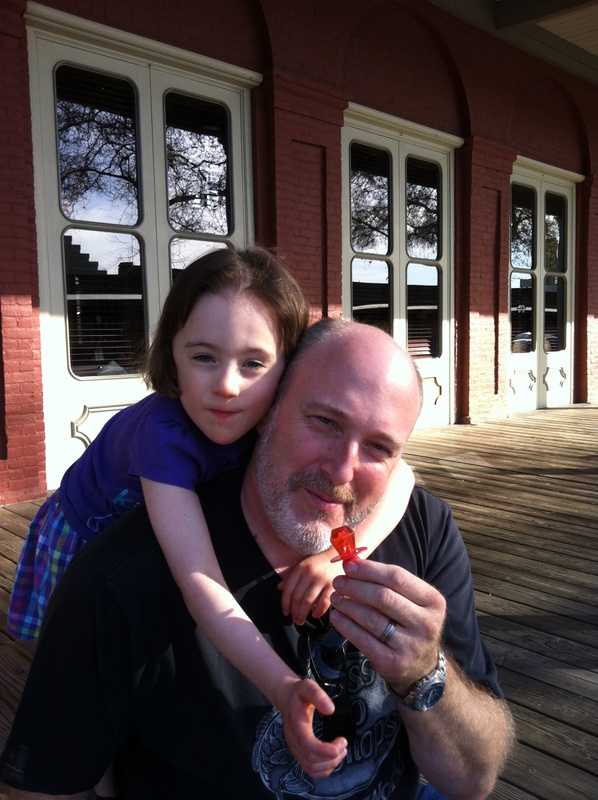 In honor of Father’s Day, one of our very special Woodall-dads graciously answered questions about his role as stay-at-home dad to Jenna, a five-year-old girl with autism. What is your role as parent in Jenna’s daily life? What is your day like getting Jenna to therapy? 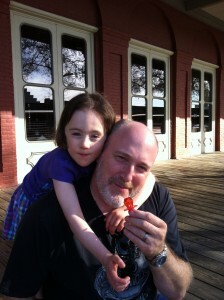 How does autism affect your role as a father? What do you want most for Jenna? What special activities do you do with Jenna- just you and her? Richard: “Anyone who knows Jenna knows her favorite thing to do is to swing. I take her outside in the back when we get home from school to swing –weather permitting. 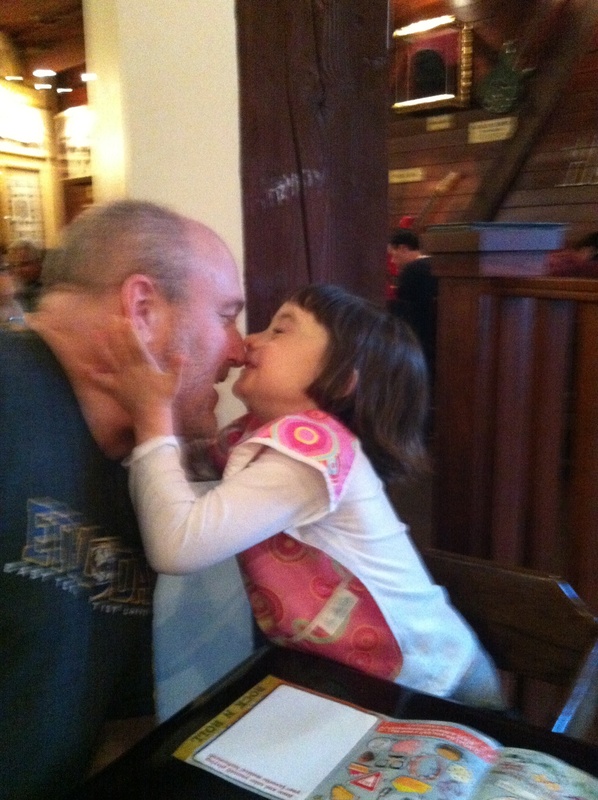 What do you love most about being a dad? What advice would you give other fathers? Does your family have anything special planned for Father’s Day, or have they told you yet? Dads, we thank you for your unconditional love and devotion and we hope that you thoroughly enjoy this special day with your families. Happy Father’s Day! How can you take your child with Autism on a family trip and make it a positive experience for all? After talking with many parents about traveling with their child with Autism, we have collected some ideas that will help you become travel- savvy for vacations with your child with Autism. Noise canceling headphones are great for when the environment gets loud and crazy on the plane, in an amusement park, a restaurant, etc. Bring them with you everywhere and train your child to ask for them. If you haven’t used headphones before, have your child practice wearing them before your trip. Airplane travel harnesses are like a car seat and can provide stability and safety for a child on an airplane. There are also travel harnesses for the car that act as a car seat. You can use this lighter and packable harness for jumping into cabs or for an older child with autism who is not ready to travel without a car seat. Bring your child’s favorite reinforcers, both electronic and not electronic. During landing and take off in a plane, you will not be able to use your electronic devices, so bring along some other toys as back up. Almost all airports are now offering mock-security and boarding practice for people who find the airport travel experience too stressful. Call your nearby airport and set up a time to do this with your family. You can practice this multiple times and with your gadgets. Bring everything you would need for the actual experience! Create a visual schedule and bring it with you wherever you go, including the airport and the amusement parks. You could have a schedule for every day of your vacation and for every airplane or vehicle you board. A schedule could include leaving and returning to a hotel room, when to eat, when to get ready for bed, when to stand in line, how many activities you plan to do and which places you plan to go, relaxation time, etc! The possibilities are countless! 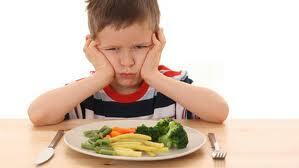 Refer back to your schedule with your child often so that your child is reminded of what to expect. Call the airline ahead of time and make sure to let them know you are traveling with a child with Autism. Ask them how they can make your experience easier. You never know what resources they’ll provide you with. Call ahead and make sure your family can sit together. One family we spoke to had a family member sit on both sides of their child and in front in case their child needed to kick or move around more in their seat. Call or visit ‘guest relations’ at each amusement park or activity you do. Most places will provide your family with passes to skip lines. Chances are you will have to wait in at least one long line, regardless of how many passes you can get. Plan ahead and have something for your child to do in these lines, whether it is a book, listening to music, wearing the noise canceling headphones, playing a game on an iPad, etc. 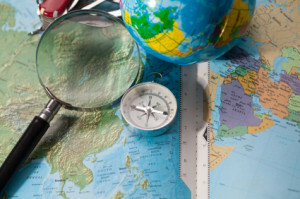 Choose activities and vacations that incorporate a topic your child enjoys. One mother said her child loved sea animals, so she took him to Sea World. Get your family excited about your adventure while at the same time orienting your child with Autism with what to expect. Watch movies about your target destination or an activity you will do while there. If you’re going to Disney Land, watch Disney movies and play Disney games. One mother, who brought her child to Sea World, spent a couple months having her child play with aquarium toys and watch sea-life videos. There are a lot of people who still do not know what Autism is or how to identify it. Chances are you will encounter a stranger who does not understand your child’s behaviors and needs. It is okay to educate and bring awareness to these people. If you find yourself in a situation where it is necessary to do so, explain clearly to the person that your child has Autism. Maybe even pack a few brochures about what Autism is and let them research Autism on their own. Several parents have suggested dressing their children in vibrant t-shirts that say “I have Autism.” Bright t-shirts would also help to identify your child if you become separated from each other. Anything can happen on vacation so make sure that your child has identification and contact info for you in case you get separated. Even the traveler experts know that making room for relaxation time makes vacation much better! Don’t ware yourself out. Allow your family time to sit in the hotel and relax while you gear up for the next adventure. Related blog post: Oh, the Places You’ll go… with Autism! My family went to DisneyLand in California during Spring Break and my son, Thomas, had a wonderful time! We were nervous about the trip as Los Angeles and Disneyland are very crowded places with many unexpected events, and we knew Thomas did not like to get on airplanes. But Thomas handled everything better than we thought! I would like to share with you what I think is very helpful for kids like Thomas to have a great time at Disneyland or any theme park. We called American Airline ahead of time to reserve our seats to make sure we all were seated together. Our flights were full both ways and the agent said they could not assign seats until the day of the trip and that there was still no guarantee we would be together. I told the agent that Thomas was autistic and we really needed to sit together. Right away the agent transferred me to the ‘Special Assistance’ department that was able to assign seating for us. At the gate I requested we be pre-boarded to reduce Thomas’s anxiety. Then we were able to board the plane earlier than most of the passengers to get Thomas settled down. On the plane Thomas requested our noise-reducing Bose headphones and wore them the entire flight. The headphones really reduced the noise on the plane and made him feel secure. I also had his favorite toys, an iPhone and iPad, to keep him occupied. During take off and landing when we were not allowed to use electronic devices, I had back up toys. When we entered Disneyland, Lego Land, and Universal Studios, we went to ‘Guest Relations’, which is normally right inside the entrance. All of these parks normally will give you ‘guest with special assistance’ passes, which will reduce the time you have to wait in line to enter certain rides and attractions. This was a huge help, especially at Disneyland where the wait time could be one to two hours long. The less time Thomas had to wait in line, the less anxiety he had. He ended up getting on more rides than I ever expected. For the first time, he also got on some of the rides all by himself! He has never done that before. We use to always have to be with him on the ride or he would not go. During this trip, there were still some rides he would not go on, but that was completely okay! We loaded all of his favorite games on an iPhone so he had something to do while waiting in lines and for special events (i.e. parades and a firework show). This kept his anxiety level down. We also had the noise reduction earphones with us at all times. Thomas used the headphones on most of the rides, during parades, and the fireworks show, when the environment got really loud. Overall, this was a very positive experience for us! 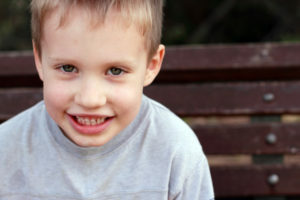 One parent shared an article by Autism Speaks, Seven Ways to Help a Picky Eater with Autism, and asked if the Brent Woodall Foundation had any other tips to add to this list. We at the BWF are big proponents of schedules. Offering a visual schedule to show your child there is a beginning and end to the challenge of tasting new foods will help take the responsibility off of you, the parent, and put that responsibility onto the schedule. The schedule will show your child what is expected and what their hard work will earn in the end. The shared article kind of touches on this, but another suggestion is to find reinforcers that are similar to the new food your child is trying out. For example, if you’re trying to teach your child to eat raspberries and you know your child just loves strawberries, offer a bowl of strawberries that have similar texture and sweetness as the reinforcer. And while we agree that overloading unhealthy reinforcers such as candy can be harmful if given too much for too long, we understand that in the BEGINNING it is very important to make the reinforcer really GREAT. So for one raspberry, give a big bowl of strawberries. Eventually you can increase the expectation and lower the reinforcer. We have recently come across a couple of grants and upcoming parent workshops you might be interested in. Here are the details! AutismCares is a group of leading autism organizations who have come together to support individuals with Autism and their families during natural disasters and other catastrophic life events. The organization offers Financial Support Awards that provide financial relief up to $1,000 for individuals with ASD and their families to help cover costs associated with critical living expenses such as housing, utilities, car repair, funeral expenses, and other essential items on a case-by-case basis. Download an application form here. ACT Today is a national 501(c)(3) nonprofit organization with a mission is to raise awareness and provide treatment services and support to families to help their children with Autism achieve their full potential. The organization provides financial assistance to help with the cost of ABA, Speech, and Occupational therapy. View open application periods here. While we have not been to these workshops ourselves, here is a list of free parent workshops you might want to check out. PEAS is an organization dedicated to creating a network of support for families of children who experience life with a disability label. Its website can be found here. Let us know what you learn! PEAS Meetup: How Was School Today? When “fine” and “okay” are not enough! The Brent Woodall Foundation came into our lives at a time when we were scared, searching, and feeling quite hopeless. Our 2 year old son at the time had just been diagnosed with autism and we were quickly discovering that the price to help our little boy was very much out of our reach. We were lost and heartbroken. We were so fortunate to meet Tracy Pierce Bender and the Brent Woodall Foundation. What an amazing non-profit organization with a mission to help children with autism and their families. From all I have seen in the past 4 years, they go above and beyond to do exactly that. My son loves his therapists that he spends time with every day and he has learned and grown so much. We have learned to teach our child at home and communicate with him and owe all of this to the Brent Woodall Foundation. When our son started there he was a very withdrawn little toddler who did not even make eye contact or acknowledge us. He has come a long way and I am so excited to see where he can go. The Brent Woodall Foundation designs and adapts his programs to work for him, because every child is different. If something does not work for him, they change it. They are easy to talk to and work with and they clearly care about my child. I drop off my little boy every day into loving, capable hands and pick him up with the feeling that my child is understood and respected. They are his “team” and like family. We celebrate his successes together. What more could I ask for? Through parent training and other support, the Brent Woodall Foundation has also given us the skills and confidence to be better parents to our son, to teach him and learn from him. Thanks to Tracy Pierce Bender and the Brent Woodall Foundation we have found the qualified, loving, and dedicated therapy that our child so needs and which has brought us so much comfort and happiness. The thought brings me to tears regularly. I am beyond grateful to them and always will be. In honor of Autism Awareness Month, several apps for kids are being offered at discounted prices or for FREE. Here are four sites featuring apps you should look into! Email Erin@woodallkids.org to give a shout out to your favorite apps- tell us why you like them! Also, look back at the Brent Woodall Foundation’s “Apps to Go!” blog post for information on other apps we like! The I Teach Hub offers a comprehensive list of applications, organized into relevant categories, including Early Intervention and Curriculum, Social Skills, Augmentative and Alternative Communication, Daily Living, and Speech and Language Development. The iMums website features several apps that are now FREE for Autism Awareness Month. It won’t hurt to try at least some of them! Smart Apps for Kids features more discounted or free applications and has included the dates for these limited time offers! Let us know what you find by emailing Erin@woodallkids.org! Related blog post: Apps to Go!